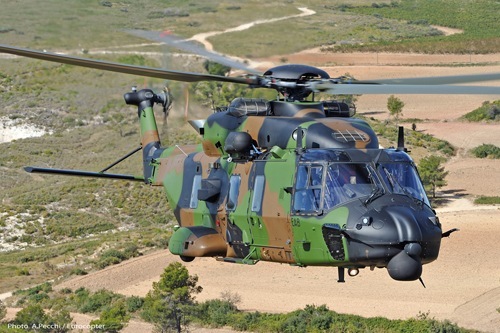 Marignane, France – The French Defence Procurement Agency (DGA) has ordered six additional NH90 helicopters in tactical troop transport (TTH) configuration, bringing the total amount of NH90 TTHs on order for the French Army Aviation to 74. “The French armed forces have deployed the NH90 operationally in Mali where its outstanding endurance, versatility and manoeuvrability have been greatly appreciated”, said Guillaume Faury, President and CEO of Airbus Helicopters. “This additional order for six NH90s, to be delivered in 2017 – 2019, confirms the essential role that new-generation multirole helicopters play in modern operations” he added. Combat-proven since 2010, the NH90 TTH has been successfully deployed by several countries in different theatres of operation. With a wide modular cabin, large sliding doors on each side and a rear ramp, the NH90 can be rapidly configured for such missions as troop transport with a 20-seat configuration, light vehicle transport, casualty evacuation with 12 stretchers, cargo airlift with standard NATO pallets, armed tactical transport, as well as combat search and rescue. An extensive list of role-tailored equipment allows the NH90 to fit operators’ mission needs. The NH90’s 4-axis autopilot and fly-by-wire controls contribute to safety and maximum flight performance in severe operating conditions. The NH90 is the first serial helicopter in the world to be equipped with fly-by-wire technologies, significantly reducing pilot workload and allowing for this state-of-the-art helicopter to be piloted with ease.